On December 13, 2005 the United States House of Representatives approved the Presidential One Dollar Coin Act of 2005. This legislation authorized the production of Presidential One Dollar Coins and the matching First Spouse Gold Coins and First Spouse Bronze Medals. Additionally the law authorized the American Buffalo 99.99% fine gold $50 bullion coins and the four new reverse designs for the 2009 Lincoln cent. The first coin was released on February 19, 2007 (the original Presidents' Day) which featured George Washington. Current sitting presidents and living former presidents are not eligible to be depicted on any of these coins. The Presidential One Dollar Coin Program honors each of our former presidents with a circulating coin. Each year four different presidents are commemorated which began in 2007 with George Washington. Each coin shares a common reverse that features the Statue of Liberty. The edge is adorned with incuse lettering that indicates the year and mint mark along with "E Pluribus Unum" and "In God We Trust". The "In God We Trust" motto was moved from the edge to the obverse in 2009 and stars were added to fill the vacated space. The 2007-2008 Presidential $1 coins featured edge-incused inscriptions of the year of minting or issuance, "E Pluribus Unum," "In God We Trust" and the mint mark. 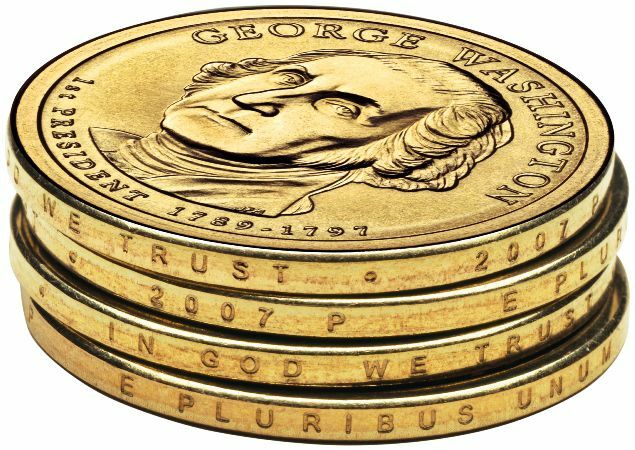 The 2009-Present Presidential $1 coins feature edge-incused inscriptions of the year of minting or issuance, "E Pluribus Unum," and the mint mark. Edge-incused inscription positions vary with each coin. The reverse design on all presidential dollars features a striking rendition of the Statue of Liberty with the inscriptions "United States of America" and "$1."